Measurements of remote celestial objects detail Earth’s orientation in space. Illustrations of Earth depict a circular planet, steadily rotating on its axis orbiting the sun. Reality is not so tidy. Earth is not perfectly round; it wobbles, spinning at a slightly irregular rate. Geodesists, researchers who study Earth’s shape, movement, and orientation in space, help us get where we want. Accurately accounting for an imperfect Earth means the next time you use GPS, you will locate the correct restaurant or find your way out of a remote canyon. Maintaining such precision requires continuous effort. To keep up with Earth’s constant change, from its rotation to its tectonic movement, researchers have created terrestrial and celestial frameworks of carefully observed reference points to triangulate positions accurately. These points help form reference frames that go beyond locating Earth in space, they reveal Earth’s tiny shifts caused by earthquakes and land rebounds after ice sheets melt. Such minute changes can only be observed if Earth’s motion is precisely measured. These reference frames are based on two sources near and far: radio telescopes on Earth, and the extremely distant celestial objects they detect. In the 1930s, engineer Karl Jansky discovered that celestial objects emit radio waves when he tried to locate radio interference. Using a large antenna, he determined Earthly sources of radio waves, yet remained puzzled by unidentified sources. After comparing the signal to astronomical charts, Jansky realized the radio waves were “star noise,” coming from the constellation of Sagittarius - 25,640 light years away from Earth. Following Jansky’s discovery, researchers raced to build dish-shaped radio telescopes. Unlike tubular optical telescopes, radio telescopes cradle an antenna in a large parabolic dish, designed to channel radio waves from very specific directions—a distant galaxy, for instance. The first dish measured only 9 meters (30 feet) across. To detect more distant celestial objects, however, dishes needed to be much larger. Many radio telescope dishes are now 25 to 100 meters (82 to 328 feet) across. “The larger dishes are more sensitive, and used more for the faint sources,” said NASA geodesist Dirk Behrend. Now hundreds of radio telescopes across Earth’s surface tilt skyward, capturing a continuous stream of radio waves. Size was not enough, however. More powerful radio telescopes were required to study extremely remote celestial objects in greater detail. So in the 1960s, researchers developed a technique called Very Long Baseline Interferometry (VLBI) to increase resolution. “VLBI is a technique where you combine the signals from multiple radio telescopes to synthesize a much larger radio telescope,” said David Gordon a radio astronomer at NASA's Goddard Space Flight Center. As radio waves from distant objects arrive, there is a time delay in a particular part of the signal arriving at one antenna versus another antenna. In that tiny delay, researchers extract a world of data. “We can measure the separation between the antennas, the rotation of the Earth, the polar motion of the Earth, the nutation, and the source coordinates,” Gordon said. Researchers also use the VLBI time delays from distant fixed objects to measure ground motion underneath radio telescope sites. Continental drift causes extremely slow changes, only a few centimeters per year, or about the rate that fingernails grow. Earthquakes, however, can cause sudden changes. 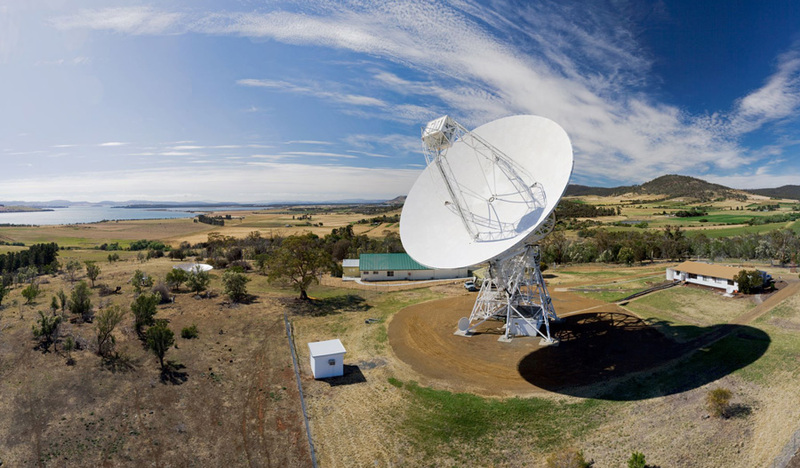 Precisely measuring the position of each VLBI telescope site helped develop a set of Earth-based coordinates and velocities, contributing to a terrestrial reference frame representing measurements taken at a particular point in time. In addition to VLBI telescopes, this terrestrial framework includes three other space-geodetic techniques and their instruments: Satellite Laser Ranging (SLR) telescopes, Global Navigation Satellite Systems (GNSS) antennas, and Doppler Orbitography by Radiopositioning Integrated on Satellite (DORIS) beacons. VLBI bridges the terrestrial and celestial references frames. The telescope sites form part of the terrestrial reference frame on a constantly rotating and shifting Earth, while quasars detected by the VLBI technique help form the fixed celestial reference frame. “By observing quasars all around the sky and measuring the delays for each one of them on each baseline, you can use a method of triangulation to solve for where the quasar is, where the Earth is, what the Earth orientation is,” Gordon said. In the 1970s, NASA helped develop VLBI because accurate and repeated observations could discern motion in Earth’s crust. By 1979, NASA had established the Crustal Dynamics Project (CDP) at Goddard, and created NASA's Crustal Dynamics Data and Information Service (CDDIS) to archive and distribute CDP data. Early achievements of VLBI include measuring the rate of tectonic spreading between North America and Europe, as well as tracking tectonic deformation along the San Andreas fault in the southwestern US. The VLBI technique has also measured earthquake motion in Alaska, California, Hawaii, Chile, and Japan. Researchers continue to rely on VLBI and the ICRF to study tectonic activity, sea level rise, interactions between Earth’s core and mantle, and post-glacial land rebound and subsidence. The VLBI technique also increased the accuracy of Earth Orientation Parameters (EOP), measurements that precisely characterize irregularities in Earth’s rotation, critical for space missions. This includes polar motion, or slight offsets in the axis around which Earth rotates—its wobble. Any significant motion or mass change on Earth’s surface can affect its axis or the velocity of its rotation, like earthquakes, large tides or ocean currents, or even melting ice. Another parameter involves time-keeping standards that measure a day as one rotation of Earth. Because Earth’s spin rate varies, the length of each day slightly varies. 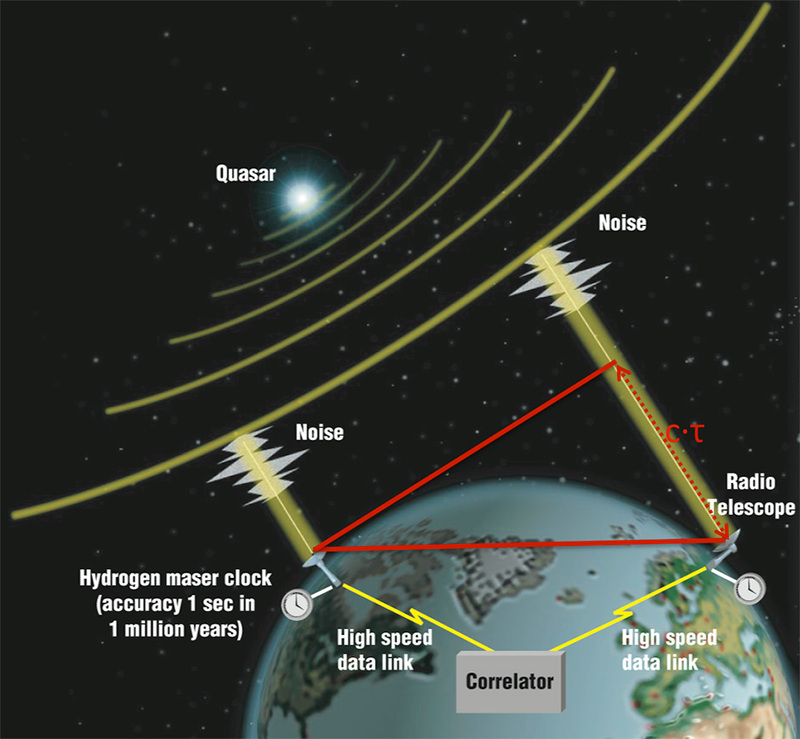 Of all the space geodetic techniques, only VLBI accurately measures UT1, a form of Universal Time based on the precise rotational position of the Earth. UT1 provides a correction to Coordinated Universal Time (UTC), on which civil time is based. “The UT1 correction changes the most rapidly of the EOP's, so it is necessary to measure it daily,” Gordon said. Accounting for these tiny motions, along with precise time keeping, improve GPS positioning. In fact, without the UT1 measurements provided by VLBI, GPS satellites would not be able to provide accurate locations, Gordon said. Several NASA Earth Science missions depend on the EOP input from VLBI, in particular UT1. For instance, the Ice, Cloud and land Elevation Satellite 2 (ICESat-2) relies on VLBI-supported data for precise orbit determination. The first version of this reference frame, the ICRF1, was completed by researchers at a host of international agencies. After being approved by the International Astronomical Union, the ICRF1 was adopted in 1998 and relied on the positions of 608 distant celestial objects. 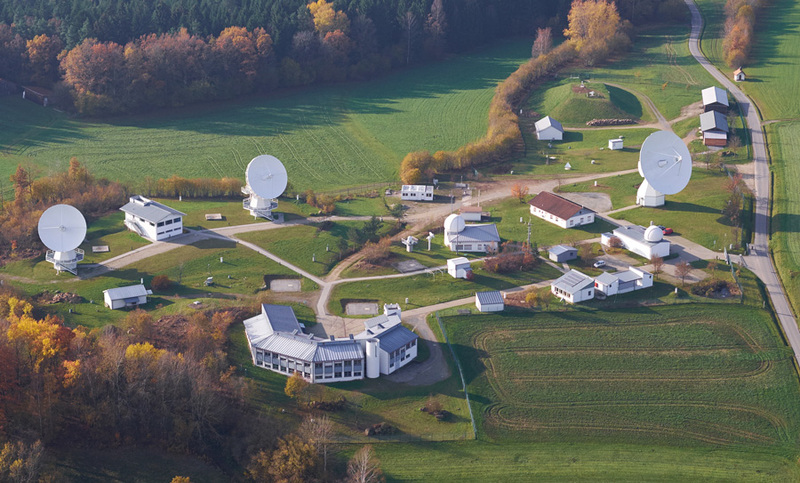 In 1999, the International VLBI Service for Geodesy and Astrometry (IVS) was formed to bring under one roof the operational activities of the geodetic and astrometric VLBI disciplines and to standardize the data flow. The central bureau of the service is hosted at GSFC and Behrend functions as its secretary. In 2009, the ICRF2 was adopted, using 3,414 sources. The ICRF3 becomes official in January 2019, based on 4,536 sources from observations dating to 1979. “The ICRF3 precision is about 30 micro-arc seconds,” Gordon said. “For an analogy, that’s about the size of a billiard ball on the moon as seen from Earth.” Gordon served as a key member of the ICRF3 working group. 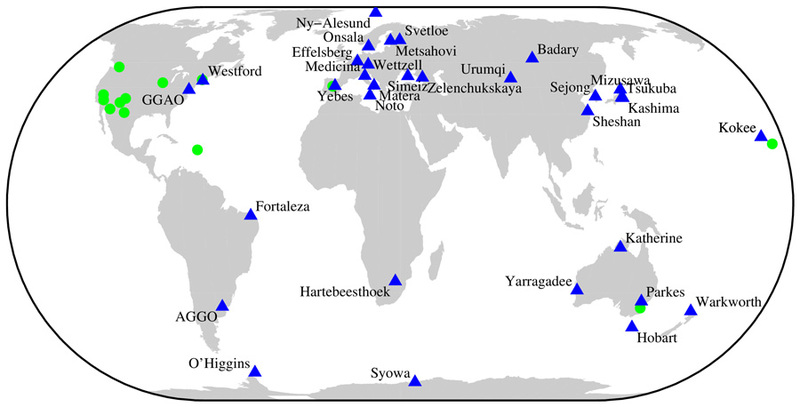 VLBI data used for the ICRF are archived at CDDIS, and at mirror sites in Europe. Over the decades, radio telescopes have advanced observations, precisely capturing minute quasar motion. Not only is ICRF3 more accurate, it corrects for aberration: a phenomenon where a stationary object appears to change as you are moving relative to it. This correction accounts for the solar system rotating around the Milky Way, completing a circuit every 225 million years, resulting in a slow drift of distant quasars as seen from Earth. “The motion is only 5.8 micro-arc seconds per year, which is an extremely tiny number, like seeing a penny on the surface of the moon,” Gordon said. Gordon, D. 2017. Impact of the VLBA on reference frames and Earth orientation studies. Journal of Geodesy 91(7): 735-742. doi:10.1007/s00190-016-0955-0. Nothnagel, A., T. Artz, D. Behrend, and Z. Malkin. 2017. International VLBI service for geodesy and astronomy. Journal of Geodesy 91: 711-721. doi:10.1007/s00190-016-0950-5. Crustal Dynamics Data Information System (CDDIS). 2018. Very Long Baseline Interferometry (VLBI), International VLBI Service for Geodesy and Astrometry (IVS) products. Available on-line https://cddis.nasa.gov/Data_and_Derived_Products/VLBI/VLBI_data_holdings.html from NASA EOSDIS CDDIS, Greenbelt, MD, U.S.A.